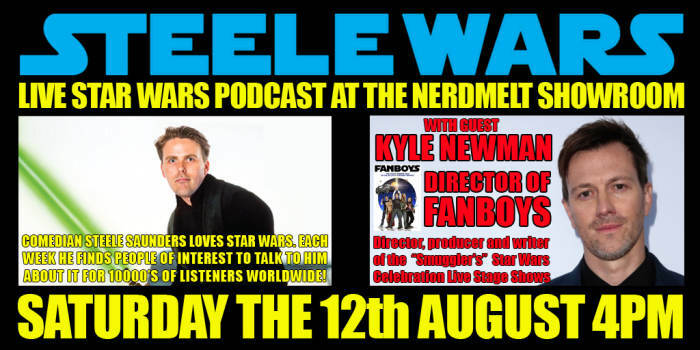 After a packed first show Steele Wars Star Wars Podcast returns to the Nerdmelt Showroom! Life long fan Steele Saunders gathers fellow comedians, celebrities and Star Wars personalities for passionate and hilarious conversations about all things Star Wars for tens of thousands of downloaders worldwide. A very funny Saturday afternoon for Jedi Master and Padawan alike. Steele will be joined by life long Star Wars fan, filmmaker Kyle Newman. Kyle is well known to Star Wars fans for directing the Star Wars themed road trip comedy Fanboys starring Kristen Bell & Seth Rogen. He’s also the director, producer and writer of the fan favourite “Smuggler's” series of Star Wars Celebration Live Stage Shows. Follow the show on Twitter at @SteeleWars for more show info!